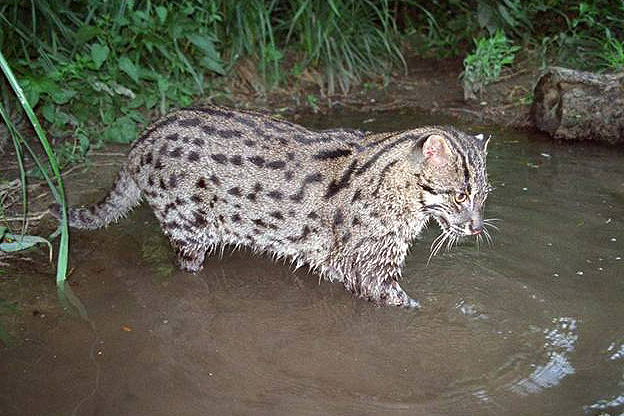 The Fishing Cat is a unique example of the great diversity of the exotic cat family. Its coat is a camouflaging grizzled grey and rather course in texture. It is tinged with olivebrown and distinctive spots and stripes. Six to eight black lines run from the forehead to the neck and break up into shorter lines and longitudinal spots on the shoulders. It has vertical markings above eyes. Horizontal white and black markings emerge from the edges of the eyes and extend up to the greyish white cheeks. The flattened nose leather is deepbrick in colour. Its short lowset muscular tail is marked with about six or seven incomplete dark bands. Its legs are short with two distinct elbow bars in forelimbs and long phalanges and claws in the forepaws. It uses its long claws as fishing hooks. This robust cat is between 57 and 78 cm long from head to body with a 20 to 30 cm long tail. It stands over 35 cm at shoulder level. An adult male weighs 8 to 16 kg, whereas a female weighs 5 to 9 kg. When in 1833 the first skin of a Fishing Cat arrived in London, the English zoologist Edward T. Bennet named it Felis viverrinus for its viverrine or civet–like appearance. At the end of the 19th century, William Thomas Blanford described its habitat for the first time. “This species haunts marshy thickets near rivers, swamps, or tidal creeks, and differs from most cats in feeding upon fish”, he wrote and therefore called it Fishing Cat. Text by Angie Appel, June 2017. Photo by courtesy of Decin Zoo. Fishing Cats live near water in thick cover in habitats such as mangroves, marshes, and densely vegetated areas along watercourses. They are very much at home in the water and can swim long distances, even under water. In the Terai grasslands of southern Nepal radio-collared Fishing Cats spent most of their time in dense tall and short grasslands and were active only at night. Given their powerful build and strong swimming abilities, it is not surprising to find that Fishing Cats take a wide range of prey. They swim under water to catch coots and ducks, and have been observed crouching on rocks and sandbanks along rivers, using their paw to scoop out fish. Their teeth are not specially adapted for catching fish or crushing mollusks but suited for killing any mammal, bird, or reptile. They are reported to be formidable hunters, and historical accounts mention Fishing Cats killing chital fawns, dogs, and even calves. Captive Fishing Cats bite hens and ducks first in the shoulder area, and then use both paws to draw the prey close enough to deliver a killing bite to the head. Birds larger than a blackbird are plucked before being eaten. There is little information on their social organisation or mating behaviour in the wild. They appear to be solitary hunters and seem to follow the usual cat land tenure pattern, in which a male’s range overlaps the smaller ranges of several females. In Nepal’s Chitwan National Park, radio-collared females used areas of 4–6 sq km, while a male’s range was much larger, about 16–22 sq km. The scent marking patterns and vocal repertoire of Fishing Cats is poorly known. Both sexes scent-mark by cheek and head rubbing, and spraying urine. Males and females utter a chuckling call, and are likely to gurgle. Kittens have been heard to mew and give birdlike “chirrups”. Photo and video by courtesy of Neville Buck. Sunquist, M. and Sunquist, F. 2002. Wild Cats of the World. Chicago: University of Chicago Press. Pp. 241–245. As the wild Fishing Cat population is rapidly decreasing, captive breeding programmes were established to ensure a back-up population exists. These programmes are run by the European Association of Zoos and Aquaria (EAZA) and the American Association of Zoos and Aquariums. All the fishing cats kept in zoos around the world are listed in the International Studbook of the World Association of Zoos and Aquariums. Each programme is managed by a coordinator who is responsible for maintaining the studbook including all the information about births, deaths, transfers, and current status of Fishing Cats kept in institutions participating in captive breeding programmes. Based on demographic and genetic data the coordinator gives recommendations to each institution regarding breeding and transfers. The coordinator and the species committee are also responsible for developing husbandry guidelines for captive care. The EAZA manages breeding programmes in three levels. The Fishing Cat Programme is under the highest level of management  the European Endangered species Programme (EEP). The Fishing Cat EEP population started with 12 founders of wild unrelated origin, and to date has five potential founders. In order to maintain a healthy population and avoid inbreeding, we need to keep more individuals, and are still looking for new participants. The captive population listed in EEP is slightly increasing. In 2006, only one kitten was born. In 2007, three kittens survived. In 2008, eighteen kittens survived, sixteen in 2009, and fourteen in 2010. 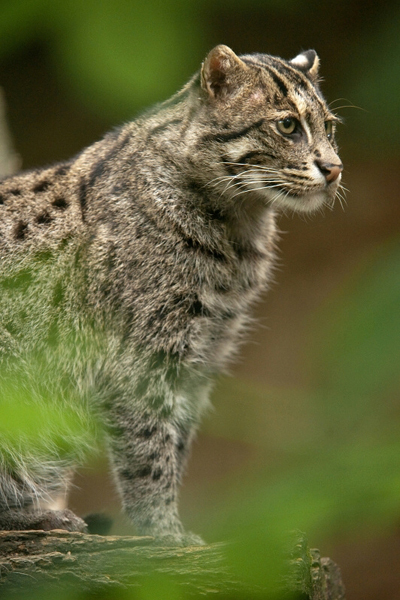 At the end of 2010, there were 86 Fishing Cats in 31 institutions. 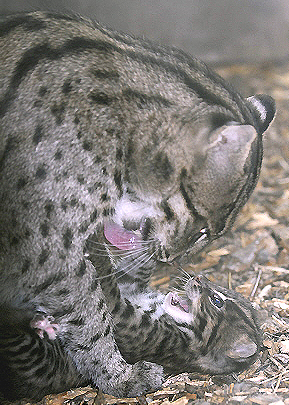 Captive Fishing Cats usually breed for the first time at the age of 3–4 years. The oldest breeding animals are around 15 years. Fishing cats can live up to 17 years in captivity. Text by Milada Reháková (Petrů), June 2011. Photo by courtesy of Martin van Wees. I am interested to have a Fishing Cat as a pet. I would like to know how to get a legal permission to get such a cat. Please let me know what kind of papers are needed. What qualities are needed from the owner of Fishing Cat as a pet? How much Fishing Cat costs if bought as a pet? My motives are give a loving home for a cat like this and therefore help to maintain to recover this noble cat species. Fishing Cat are wild animals. They are not for sale as pets. To keep a Fishing Cat, you need to own an officially recognized zoo and provide a large heated enclosure. Your zoo also needs to join the European Endangered Species Programme or the North-American Species Survival Plan. However, the best home for Fishing Cats is their natural habitat in subtropical and tropical wetlands of South and Southeast Asia.